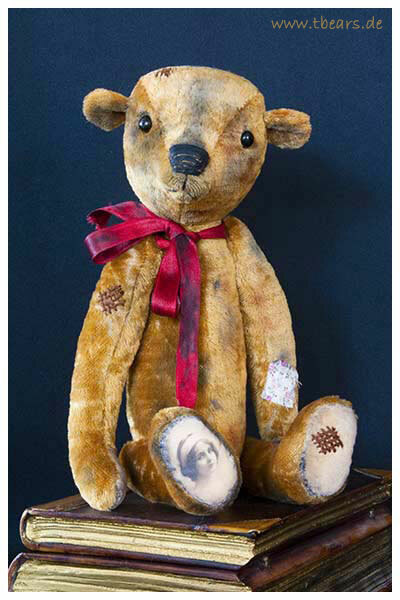 Teddy Bears by Karin Jehle from Lovable Fellows, page 4. 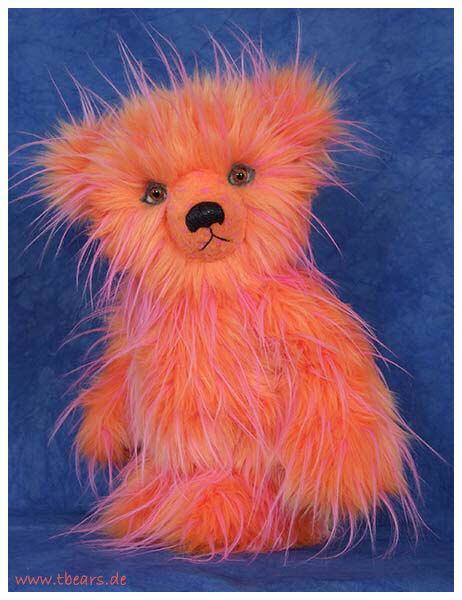 SIZE: 32 cm (12.6 inches). 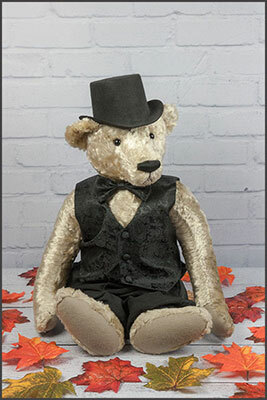 USED MATERIALS: German Helmbold Mohair. PAW PADS: Back side of the Mohair fabric. EYES: Genuine victorian shoe button eyes. DETAILS: Special antique treatment. 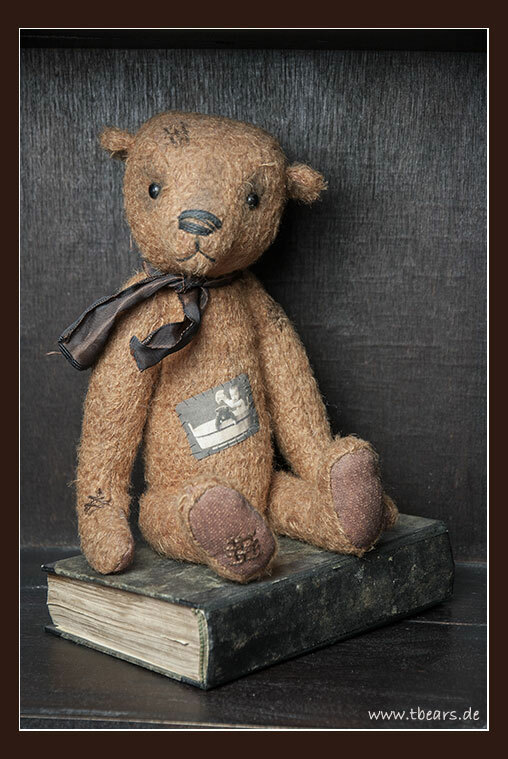 "Repairs", a patch and gentle shadings for an antique look. 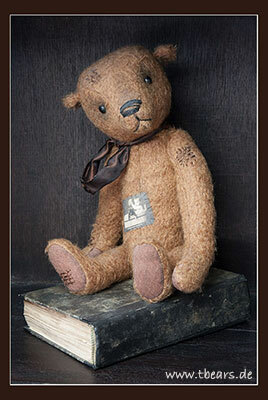 USED MATERIALS: Over 100 year old Mohair between 1890 and 1900. The Mohair is in a good condition. It has only very small amount of fur loss. 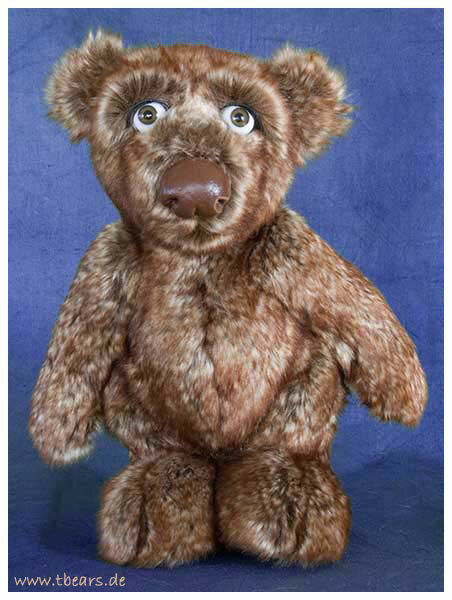 EYES: Hand painted brown German glass eyes with black pupils. 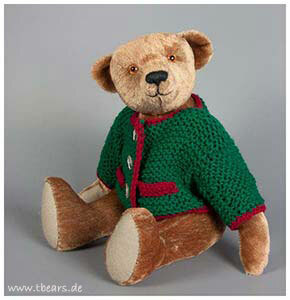 CLOTHING: Hand-knitted green cardigan with red border. 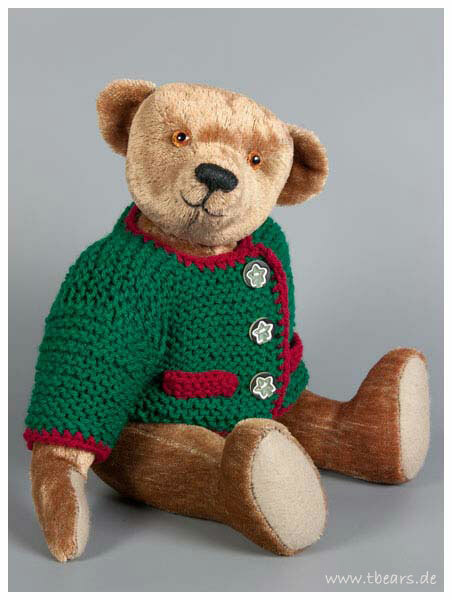 Two knitted-in pockets and 3 buttons. DETAILS: The bear is inspired by an old German bear from about 1910 which I've seen in an antique store. I felt in love in his friendly face. SIZE: 25 cm (9.8 inches). 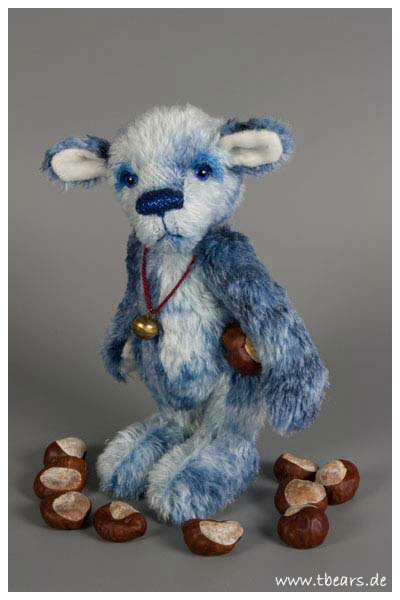 USED MATERIALS: Hand dyed Mohair in blue and white. PAW PADS AND INNER EARS: White Cashmere. EYES: Alive hand painted blue German glass eyes with black pupils. Upper eyelids. NOSE: Embroidered, two different blues. ACCESSORIES: Little bell on a red cord. 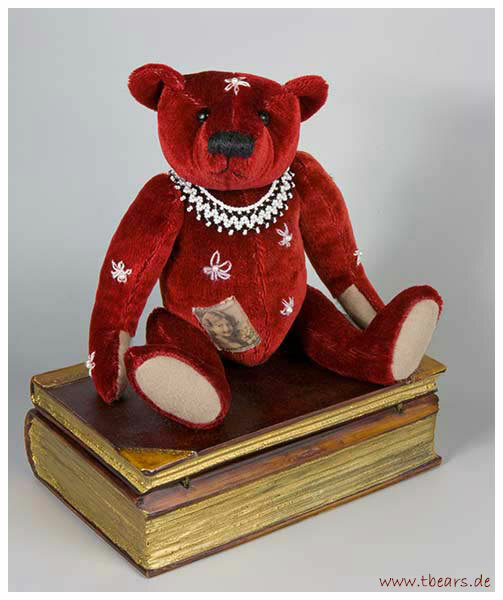 DETAILS: Free standing bear. Hand dyed Mohair. Shaded face. 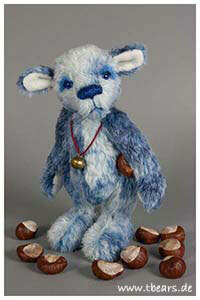 Rascal is a cheeky little bear who likes to collect chestnuts and he is allways full of mischiefs. 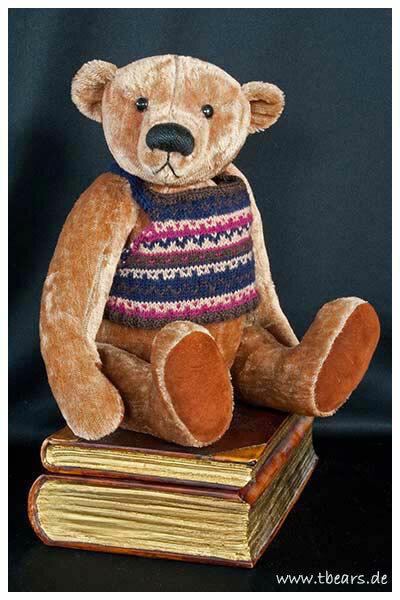 SIZE: 29 cm (11.4 inches). USED MATERIALS: Over 100 years old Mohair. DETAILS: Flowers embroidery with beads; a patch with an antique photo from a young girl. ACCESSORIES: Handmade necklace made in many hours from little beads. 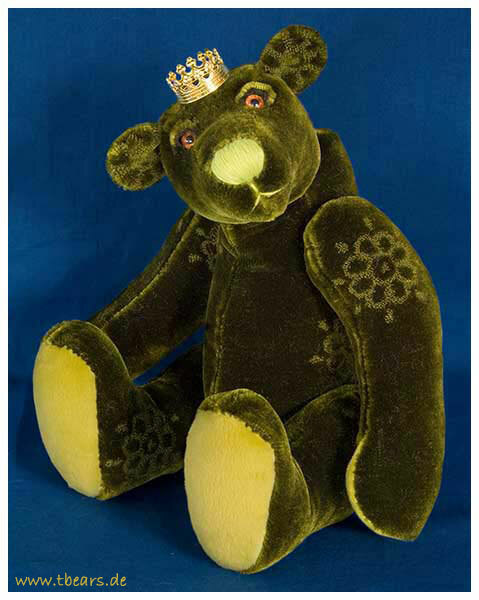 Ekkehard, 32 cm (12.6 inches). 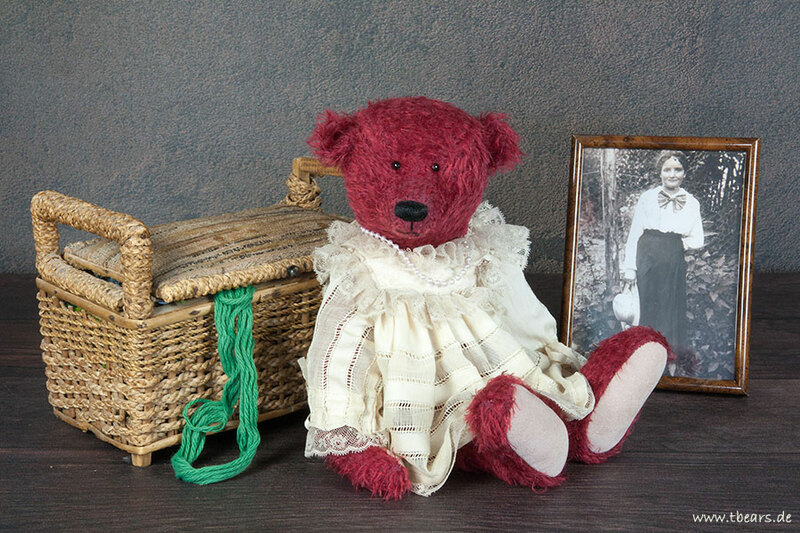 Sarah, 29 cm (11.5 inches). The Frog King is 35 cm (13.7") tall. 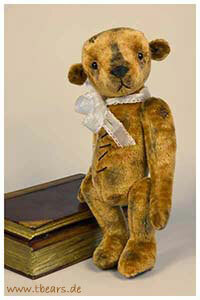 He has been created using an antique French silky Mohair from 1890-1920, maybe older. There are small cut/voided flowers on it. It's very unusual and very rare to find. It's in an excellent condition. 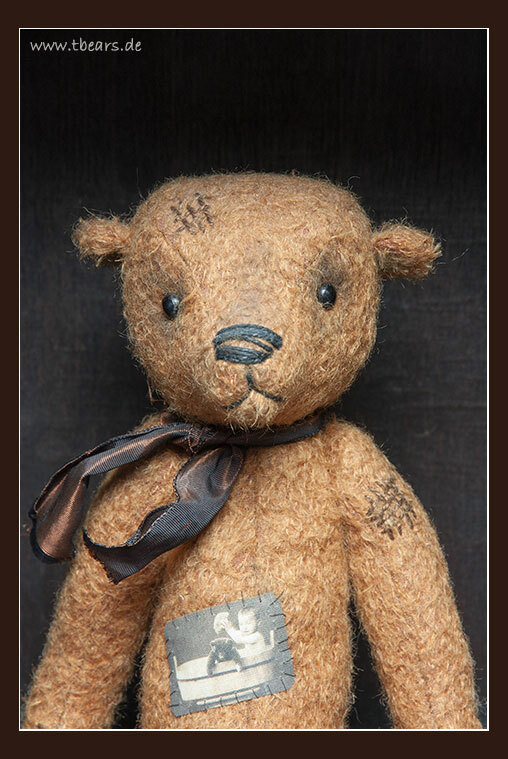 I've embroidered the nose of the bear from a very old yarn from my grandmother. 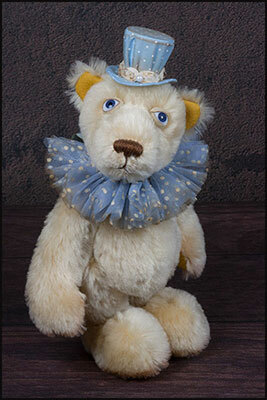 The teddy has German handpainted glass eyes with upper eye lids. Praline, 30 cm (11.8 inches). Karl Heinz, 28 cm (11 inches). Sir Henry a true Gentleman is a 20.5 inches (52 cm) tall traditional vintage style teddy bear. 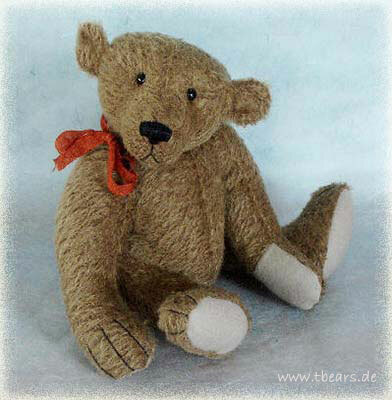 Like the early Steiff bears he has a traditional hump and a center seam. 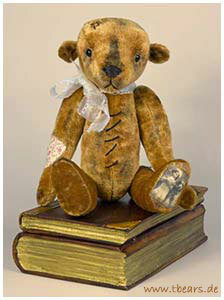 He is made from antique silk/rayon velvet. 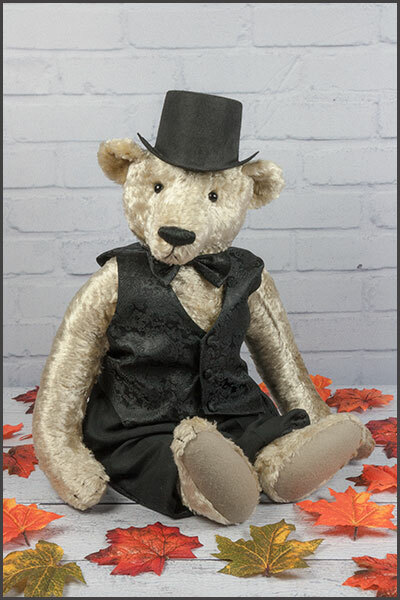 Sir Henry has black glass eyes and is filled with polyfill. 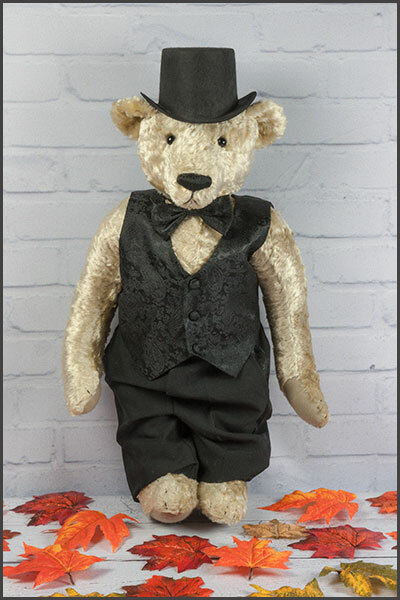 He wears elegant black trousers, a black patterned vest, a black bow-tie and a top-hat. 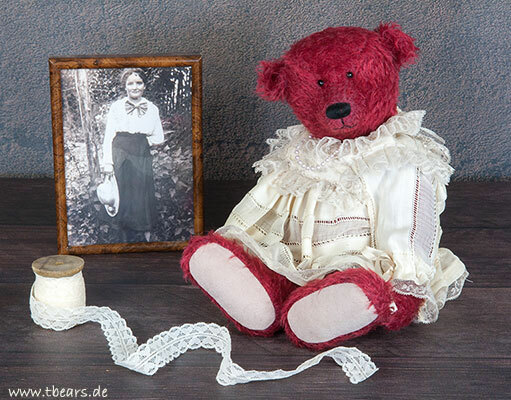 Rosi is a 13.3 inches (34 cm) tall traditional teddy bear. She is made from antique sparse mohair. Rosi has black glass eyes and is filled with sheep's wool and pellets. She is loosely jointed and she wears a romantic lace dress. 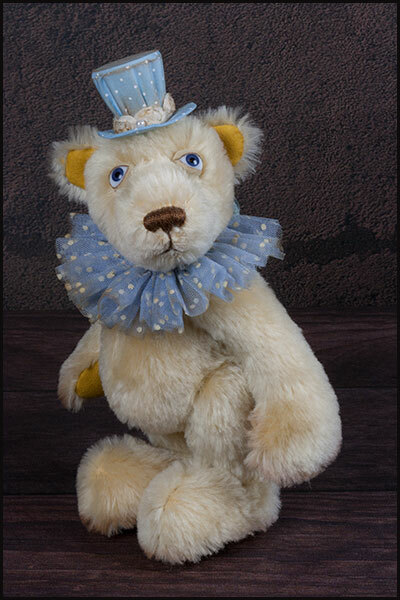 Emil is 50 cm(19.7") tall. 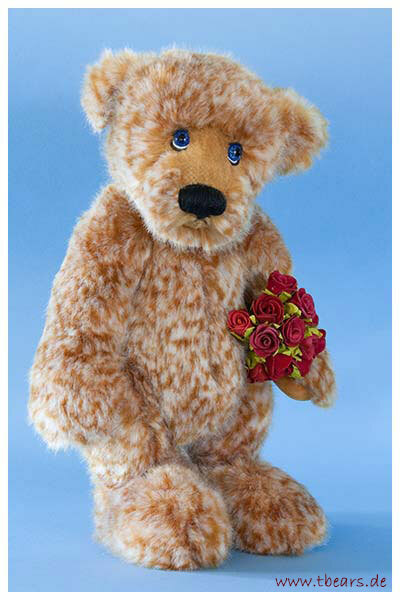 He is a vintage style bear created from blond German Schulte Mohair. He has green brown glass eyes with iris and he is filled with sheep wool. 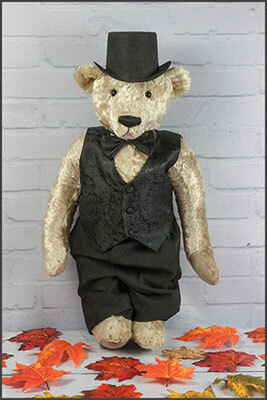 Emil wears vintage style clothing: trousers with embroidered suspenders, a bow tie, a news boy cap, creamy ivory dress shirt, long sleeved with buttoned cuffs. 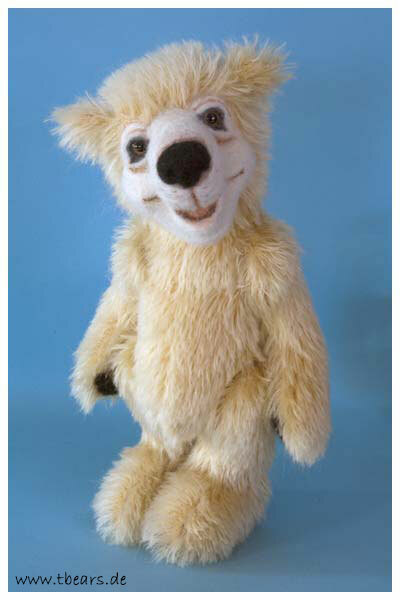 Please wellcome Herman, a cheeky little fellow with huge personality. 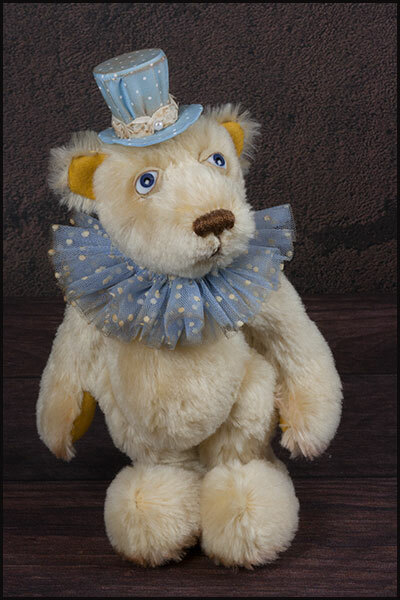 He is 10.4 inches (26,5 cm) tall and made from light yellow German Steiff Schulte Mohair. 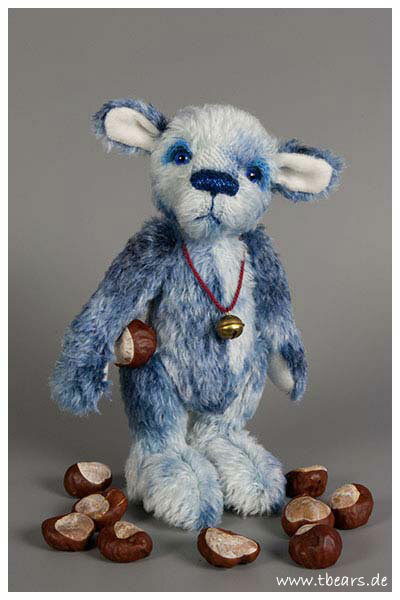 Herman's eyes are blue blown-glass doll eyes with ultrasuede lids. His inner ears and paw pads are made from matching thick felt fabric. 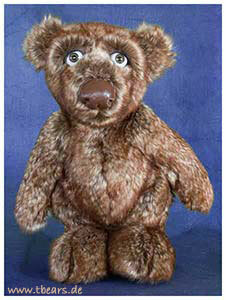 He is stuffed with fibrefill and is airbrushed on his feet and paws. Herman wears a ruffle and a Stepi hat. 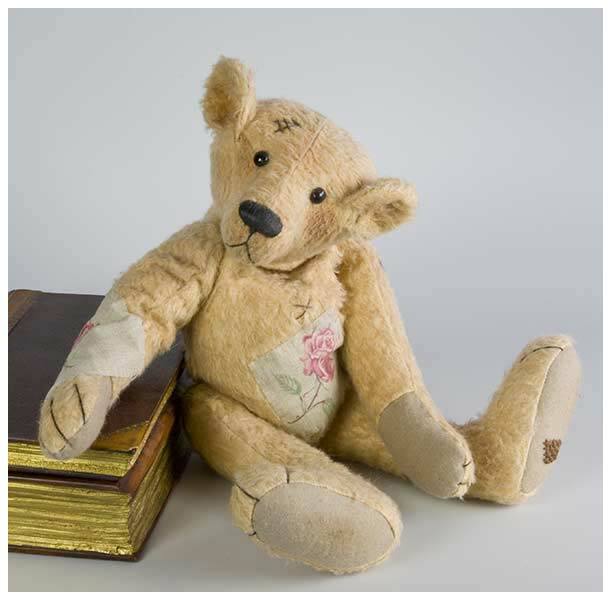 Gustav, 14.5 inches (37 cm).